When I take photos for my blog I am fastidious about taking down the credits. 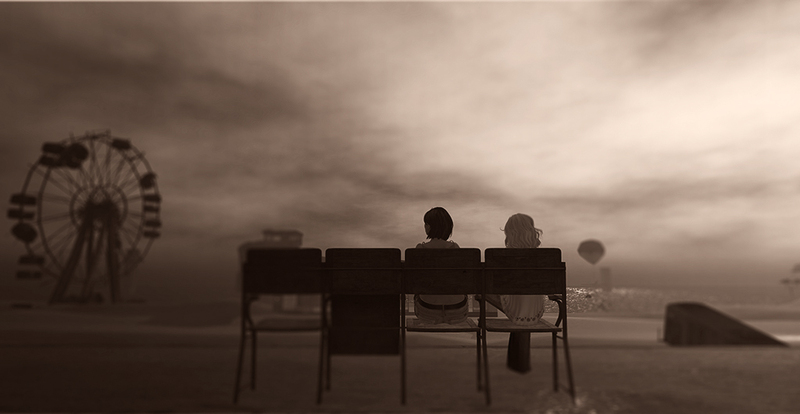 I think it’s important to give proper due to the amazing creators of Second Life. I’m breaking my own rule here today. I’m blogging and I’m not going to do credits. Not because the creators of everything in this photo aren’t amazing, but because I had no intention of blogging this picture when I took it. It is just a happy snap I took while hanging out with my sis. I love going to visit Rwah. She’s amazingly talented and it is rare to see her sim looking the same way on two successive visits. But I liked this particular incarnation. So while we were sitting there discussing her latest vision for her space, fashion, men, and life in general, I snuck my view behind us and took this shot. I didn’t let on; I just passed her the raw shot after I had taken it. It made me happy. Just spending time with Rwah. No pressure to hit deadlines, no clients to prep for, no pressing shopping events I just had to attend. Just two sisters, no credits and a beautiful memory, captured in a photograph. My sister, myself, a bench (from junk.) and a vista. And you didn’t give away my seat! ❤ gorgeous picture! you are such a beautiful person. The day I dared to hop on your blog and comment for the first time, was a good day. Thank you for being you sweet Peep. Betsy is going to live on the beach.